Successfully Added Xiaomi Mi Bluetooth Speaker - Built-In Mic, Bluetooth 4.1, 10M Range, 1200mAh Battery, LED Indicator (Black) to your Shopping Cart. This Xiaomi Bluetooth speaker allows you to listen to your favorite tracks wherever you’re at. Thanks to its stylish and compact design, this wireless speaker from Xiaomi is not only stunning to look at – it also is extremely portable. Crafted out of high-quality and lightweight PC and ABS material, this portable Bluetooth speaker can easily be carried around no matter where you’re headed. Whether you’re at home, in the car, or enjoying a peaceful sunny afternoon in the park with your friends – with the Xiaomi Mi Bluetooth speaker you’ll always be able to play your favorite tracks to take the most out of all your upcoming activities. Supporting Bluetooth 4.1, this wireless speaker can be easily paired and connected to all your mobile devices. Simply synchronize this beautiful Xiaomi speaker to your smartphone or tablet and you’ll be able to listen to all the favorite tracks from your mobile library in audiophile-grade quality. With a range up to 10 meters, you can be assured that your music will always be playing loudly even while your phone and speaker are not in close proximity – giving you more freedom to move around the house with your phone at hand while simultaneously continuing to listen to those all time classics. Featuring a maximum power output of 5 Watt, the Xiaomi Mi Bluetooth speaker allows you to crank up your volume greatly – letting you take the most out of your audio experience. Simply give a spin to the top of this beautifully designed wireless speaker to adjust the decibels to your liking. 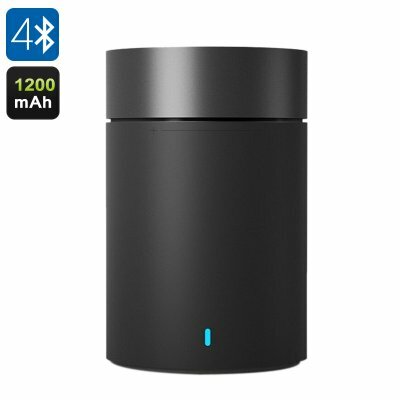 Thanks to a massive yet compact 1200mAh battery, this lightweight and highly portable Bluetooth speaker lets you enjoy a stunning audio experience for up to 7 hours continuously – allowing you to get through a day filled with wireless music playing without you needing to worry about running out of juice. Additionally, this Xiaomi Bluetooth speaker also features a sophisticated LED power indicator on the front of the device – keeping you constantly updated on your current battery level and ensuring that you’ll never unexpectedly run out of power. Besides allowing you to enjoy all your music in truly stunning quality, this wireless speaker also features a high-quality built-in microphone that lets you engage in hands-free phone calls. Simply pair this portable speaker with your smartphone and whenever you receive an incoming phone call you’ll be able to efficiently answer your call without you needing to physically reach for your telephone. Perfect for conveniently answering your phone at home or for making safe hands-free phone calls when on the move, the Xiaomi Mi speaker is guaranteed to increase your overall calling experience – allowing you to take the most out of this beautiful Bluetooth speaker and smartphone at the same time.